Coupler is a plug and play part. Simply slip off the knuckle coupler found on your models and attach our H2A. Pirated Parts - When we encounter a part or assembly that belongs to our company used on a model built by another company that was used without our authorization we refer to that as "Pirating" parts. We ask the builder-importer to pay a license fee for the use of the part. If they refuse, we have no recourse other than to refuse to provide components, or drives for anyone owning that model. Our license fees are reasonable, and are about the same as the profit on one brass model. There is no reason for companies to steal from us and profit from that theft. Should you be told that your model has a pirated part we ask that you ask your builder-importer to pay the license fee - or ask for a refund on that model. Due to the unlicensed use of our parts on their models and unpaid license fees we will not longer convert to power, repair, or provide components for ANY model offered for sale by Car Works of Warren, New Jersey, regardless from what source they were purchased. The same embargo exists for the Western Hobbycraft Johnstown car for the same reason. This will stay in effect until Car Works and Western Hobbycraft pay their license fees, and cease the unauthorized use of our parts. UPDATE - October 2015 - To accomodate folks stuck with the above models we will waive the embargo if you are willing to pay the license fee (the cost of the pirated part) for that model, we will provide trucks and parts. Deliveries - White metal casting delivery is improving. Most out of stock items you see in our listings are on order. Your patience here is appreciated. We try to order items in advance of the bin going empty, but re-supply is not always consistent. Parts are not always sent in the order of need. Rumors - Please be wary of rumors. These may be the result of what one well know distributor in Wisconsin tells it's customers when it decides not to carry a product. Instead of saying that a product is no longer stocked, it will tell that person that the product, or in the case of an entire line, has been DISCONTINUED. This then gives the impression that the item or line is no longer available anywhere, or that the company that made it went out of business. Another problem, is brand confusion. Some people assume they know a company by what it makes. A truck maker is a truck maker, and although the names are different what one does or does not do is often confused with the other. To make sure what you hear is correct, please contact the company that makes the product you are looking for directly to verify if the item is or is not available. In the case of Q-Car everything that we list here IS available subject to out of stock conditions. If we list it we make it. If your dealer can't get it you can order direct. For your convienence we accept PayPal. There has been a 7% accross the board price increase on all products. Prices have remained stable since 2010, and with the ever increase cost in doing business prices had to change. Those changes are reflected in this web site. Also, due to a computer failure we were unable to update our stock list from June to late September. Some items listed as out of stock, were back in stock, and some items listed as in stock were out. The problem has been resolved and the current listing is up to date. 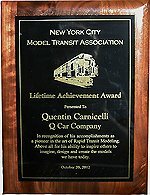 It was with great humility I accepted the Lifetime Achievement Award from the New York Model Transit Association and their fall meet in New Brunswick, New Jersey. 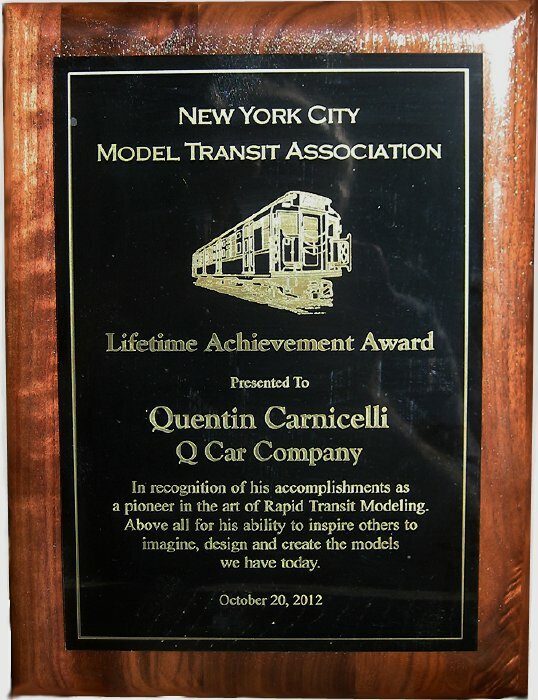 The last forty years would not be possible without the great and everlasting loyalty of all who have so generously supported the endeavor we call the Q-Car Company. 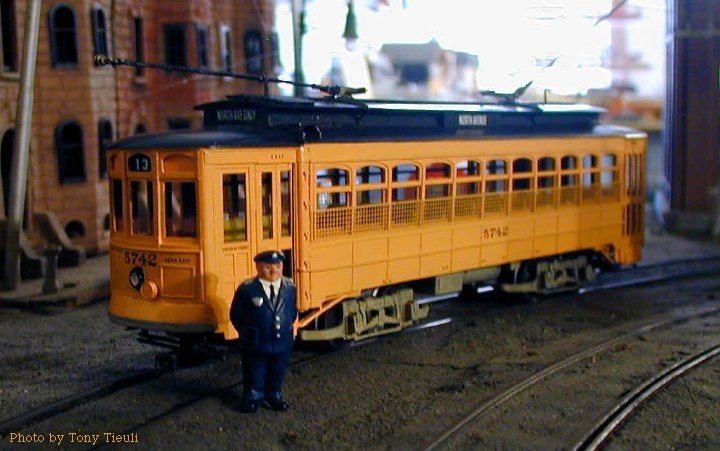 Tony Tieuli and Charlie Pitts proudly announce the Portland Streetcar model for experienced modelers. 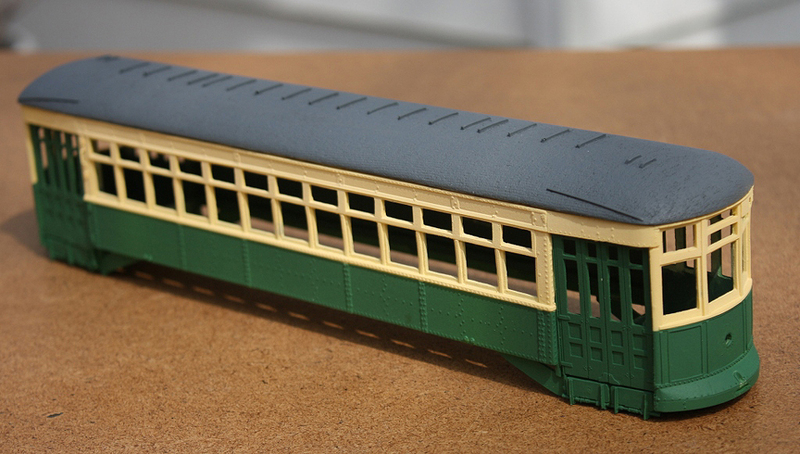 The exquisitely detailed sections include a separate floor with molded seats, operator's cab and console on both ends. The car comes ready to assemble and paint. Your choice of trolley poles or pantograph. An added bonus is fitted tinted window glass for sides and windshields. Car will negotiate 12" radius curves and paper diaphragms will be available at extra cost. Instructions for assembly included. These cars ran on St Louis B3 trucks with 26" Super Resilient wheels, available from Q-Car. 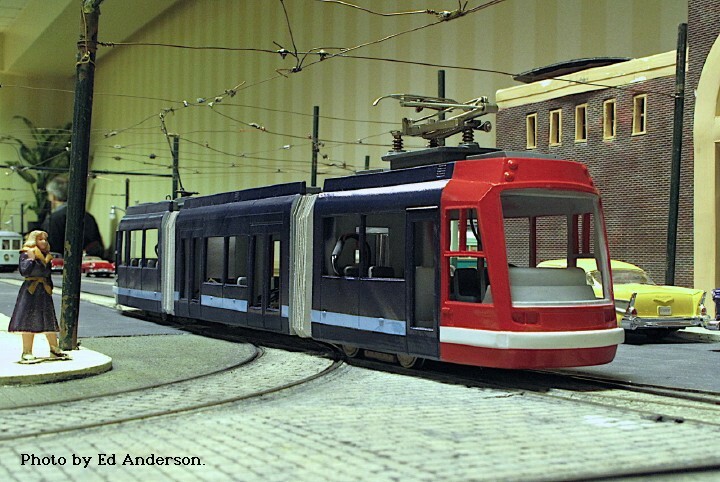 A year in the making, Island Model Works has produced a superb low floor LRV model representing the first contemporary car able to operate on existing O scale layouts. Get yours now for $149.99 plus shipping! Contact: Island Model Works for details on how to order. Act now to insure getting this car while supplies last. Contact Island Model Works direct - cars are NOT available from Q-Car. MT010P4 St Louis B3 Trucks are available from Q-Car. 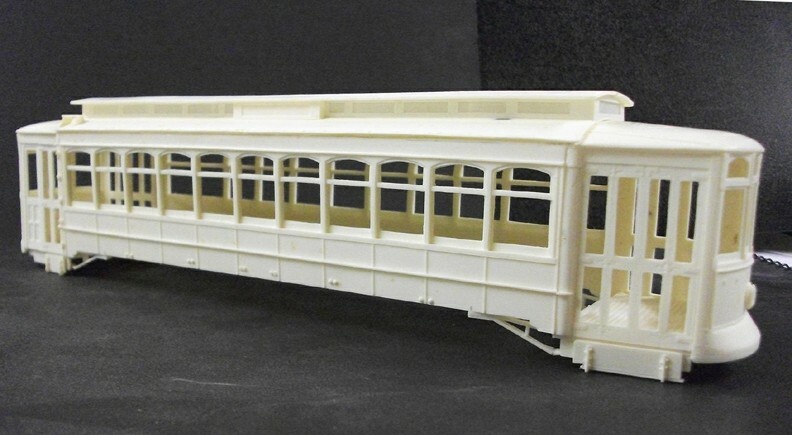 Dave Gairo has a kit to build a PRT – PTC 5200 car body is now available in limited quantities. This car is the 1923 double-end Brill car series that was still in operation until 1957. The kit is made up of resin castings to build a complete body, excluding the floor. The photo shows the completed kit painted in one of the last paint schemes. These cars ran on Brill 39E2 trucks. Cost is $90.00, plus shipping. MT010SGL CS216 Brill 39E2 Trucks are available from Q-Car. Contact Dave direct - cars are NOT available from Q-Car. 21 Jan 2012 - Bangor, Pa - Truck Parts. Until further notice truck parts including sideframes will not be sold separately. They must be purchased in assembled trucks. Due to the devaluation of the dollar against the Yen, the price of motors has increased TWICE in the last six months. What could buy ten motors last January, now only buys seven! 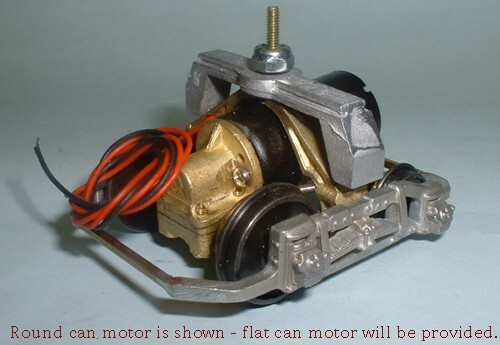 Effective immediately the price of anything containing a motor has increased accordingly. 1 Nov 2011 - Bangor, Pa - October Snow! Mother Nature part two - a "nice" winter storm last Saturday left us without power or communication for four days. We are back on line with a few tree limbs to cut up, and an order backlog that just keeps growing. Heavy wet snow demolished the local power and communication infrastructure. Trees took a big hit also. This just keeps adding to delays in delivery over which we have no control. Some good news - wheelset delivery is on the upswing. Your patience is appreciated - orders will go out as fast as we can get to them. Greg King transitclassics@netspace.net.au has just finished pattern work on this series CSL streetcar with production underway. They are available through John Engleman jve7407@verizon.net and through Greg. Contact Greg or John for more information. The MT010 39E Brill trucks used under these cars can be ordered from Q-Car. We survived the storm with just the usual yard flooding Little Martins Creek sends our way when inch an hour rain totals more than six inches! We lost about four days in trying to prepare for the storm - reinforcing the creek walls to reduce erosion, and sandbagging obvious trouble spots. There was no damage to the shop - we had power throughout the storm but lost all communication for three days. Except for a few tons of sand that has to be removed from the lower yard we are back to normal. Thanks to all of you who have been waiting patiently for your orders to be filled. Rest assured we are moving along and everyone will get what they ordered as soon as time and material availability permits. Due to slow delivery of some of the components we use to build trucks we have been making adjustments to the truck delivery schedule to try and get as many trucks out as we can. We ask for you patience as our suppliers do their best to keep up with the orders we continue to send their way. We are at least three weeks behind as a general rule, and in some cases months behind. Be assured that as material arrives orders will ship as close to their queue positions as we can. It is with great trepidation that I have to tell you that the white metal casting cost to us has increased twenty three percent in one fell shot! And at the same time mold cost jumped ten percent. We have absorbed the last two increases but this is more than can be absorbed at this time. We just want to give you fair warning the prices for white metal castings, and any products containing them will be increasing in price in the near future. Greg King transitclassics@netspace.net.au has just finished pattern work on this series heavy weight Baltimore streetcar with the first production run underway. They will be available through John Engleman jve7407@verizon.net and through Greg. Contact Greg or John for more information. The DS171 Finishing Kit, and the MT010 27GE1 Brill trucks used under these cars can be ordered from Q-Car. Coupler is a plug and play part. Simply slip off the knuckle coupler found on your models and attach our H2A. Use at each end of your train for that scale appearance. If requested painted couplers will be available. 20 October 2010 - From NWSL Hamilton, MT : Due to price increases announced by NWSL on all wheelset products, trucks, and all wheelset products will increase in price effective 1 November 2010. 27 May 2010 - Bangor, PA: A downloadable copy of our product is now available free of charge. It is the same Non-Illustrated Listing we use as a ready reference source of what we make. Please check our Product Listings page for the link to the listing. 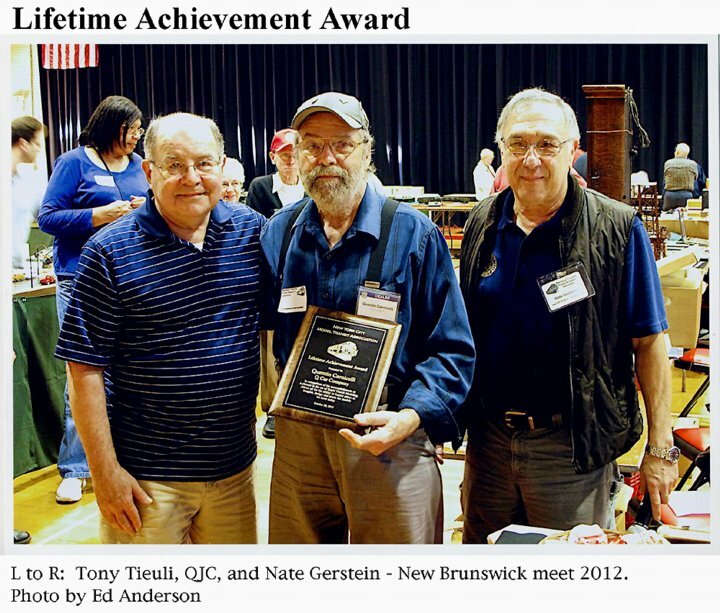 22 May 2010 - Boston MA: The prize winning model scratch built by Charles Pitts went missing during the breakdown of the meet at the Americal Civic Center. We are asking anyone who was there during that period to please check their packages, packed boxes, or carry bags to make sure this model is not mixed in with their belongings. Anyone with information about the shed can reach us at contact@qcarcompany.com. UPDATE - 6 June 2012 - Boston, MA: THE STRUCTURE WAS FOUND - INADVENTLY PICKED UP AND PACKED AWAY BY THE SEASHORE TROLLEY MUSEUM. IT HAS BEEN RETURNED TO CHARLIE. 5 January 2010 - From Q-Car Company, Inc. Bangor, Pa.: Due to the ever increasing cost of production, and the lost value of the dollar, prices have increased 3% across the board. The prices at this web site reflect that change. 1 January 2010 - From NWSL Hamilton, MT : Magic Carpets® are being re-designed to accept a new motor. As soon as the redesigned units are available we will let you know. 1 Jan 08 - From Q-Car Company, Inc. Bangor, Pa.: Prices have increased effective 1 January 08. The prices at this web site reflect that change. 9 Jan 07 - From Labelle Woodworking, Cheyenne, Wyoming: Labelle has announced that they are remaking most if not all the O Scale Traction kits that were the mainstay of this hobby in the seventies and the eighties. Please check with them directly for prices and availability. For current pricing go to our Product Listings section. To see earlier news items please go to our What's New & Industry News Archive. The May 2017 East Penn meet at Ag Hall in Allentown was a great sucess. See you next time (2019). For additional information please go to East Penn Meet Info. Contest Rules are available at East Penn Meet Contest Rules. We will be at this meet on Saturday only. Please keep in mind we only display at meets; we do not bring stock to sell. We will take orders, and we are there to answer your questions. We do not charge shipping for any item ordered at a show. If there are items you want to pick up at a show, please order them in advance. The usual delivery schedule applies so please plan ahead.